Four Seasons (not affiliated to the hotel) serves a limited menu but there's an item to cater to every member of the family because the food served is western and Japanese. I can bring my mom here and order an udon for her while I tuck in an Aussie-style beef pie. Terence the chef and owner was trained in French cooking and apprenticed under a top Japanese chef in Perth for many years before relocating to his hometown. I've had good meals here and the restaurant is cosy and pleasant, one of those homey places where you can eat without worrying what to wear or who you'll run into because it is open only at night, Mon to Sat and tucked away in a small lot next to CoffeeBean Damai which means it is rather low-key in terms of exposure. The subdued atmosphere is fine to me but may not appeal to the younger crowd who might prefer a happening place kind of atmosphere like Party Play or the place for good atmosphere, cheap beers but bad food, Upperstar, a few doors away. Maybe that's how Terence wants it, small and manageable. Also, the food can sometimes be not quite how you like it. Maybe that's when Terence isn't around. Grilled prawns done very well--succulent and fresh. This would've been better if slightly underdone. The tenderloin (chilled, not frozen, Terence told me) was tender and flavorful at first bite but with subsequent bites, the flavor wasn't deep enough, not unusual for tenderloin. 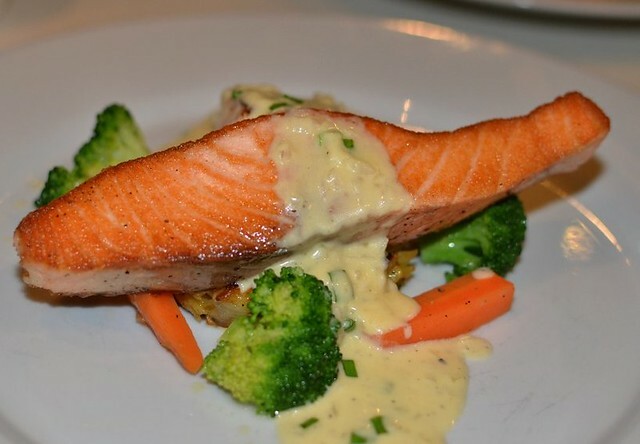 Like the salmon, this would have been better if medium rather than well done. Still, this was better than the steaks in most other places. 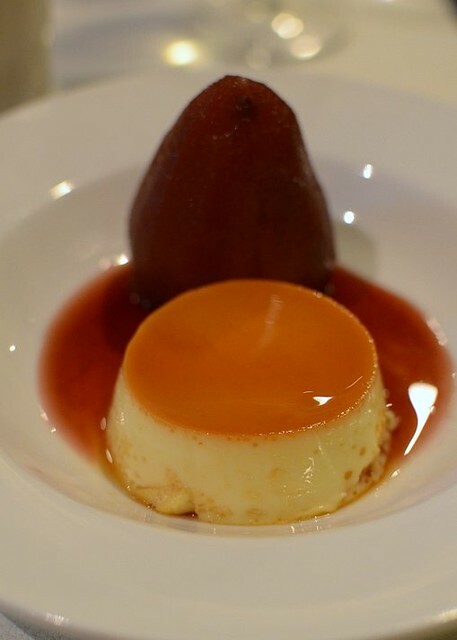 Caramel custard with pear poached in red wine was simple but delicious, thumbs up. 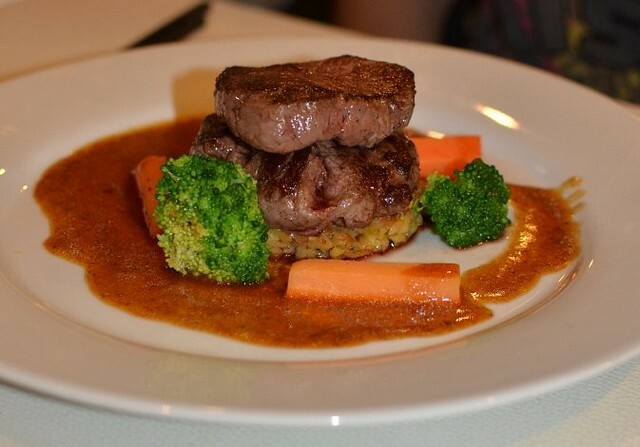 This is a nice little restaurant for a good meal that won't empty your wallet. I love the lacy and light tempura here and the Singapore laksa they used to serve. Good place for eating a quick quiet meal with the family. Don't expect to linger. They close early. And make sure it's Terence who cooks. Four Seasons, next door to CoffeeBean Damai. Open Mon to Sat, dinner only. Open on Sat for lunch too. 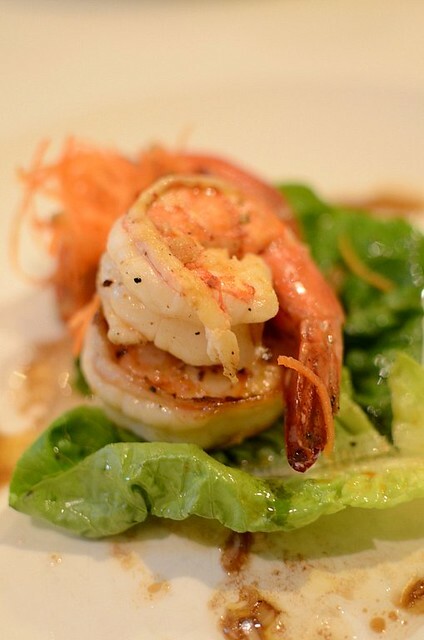 The grilled prawns look terrific! yi: yes, i felt tt too when i wrote the previous post on endives n read the posts on delft. i suddenly missed the place, how it felt when i walked along the canals teeming with budding yellow water lilies, how the air smelt and the wind in our hair as you rode me around on your bicycle and we were so happy and thankful for the chance to live in europe and esp delft, tt place near the square where ppl sat n drank n looked at ppl passing by:)) do u rmber tt? the shop where i was supposed to bake? n the saturday markets n the 2 handsome blond boys we always buy stroopwafels from. the freshest tulips. the antique market. the church with a red maple tree and the square in front of it. it was probably one of the best decisions you made to study in europe. it made you 'global'. even if you go back for a couple of months as a tourist, the feeling will not be the same. i can still see you in a black coat and red bag cycling around the uni and town. n tt amazing lecture hall with the big screen. the archi building was awesome! the night we stayed up to do your model! the weekend aunt yoland came to stay n the weather turned bad:)) the last day when we spent hours lying on the grassy knoll on top of the library talking about your future...thanks for those precious moments. i'm glad tt i blogged about those times!one day when i'm old and amnesic, tell me about those times we spent in europe... love you too sweetest heart! okh: they were so good. it's a pity tt the best seafood here are now exported. i was at the market this morning n the prawns look like they are half rotted:( how's the seafood in hawaii?